With Expecting Better, award-winning economist Emily Oster spotted a need in the pregnancy market for advice that gave women the information they needed to make the best decision for their own pregnancies. By digging into the data, Oster found that much of the conventional pregnancy wisdom was wrong. 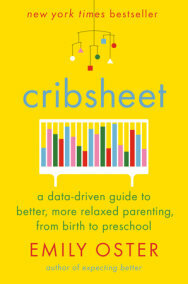 In Cribsheet, she now tackles an even greater challenge: decision-making in the early years of parenting. Browse below to find reference books of all kinds.